Industrial designer, Don Chadwick, is possibly best known for his instrumental input into the Nineties’ iconic Aeron chair for Herman Miller. He is about to witness the result of a more recent collaboration with the company with the launch of Aeron Remastered. California-based industrial designer Don Chadwick, of Chadwick Studio, has worked with some of the biggest furniture design manufacturers in the world. 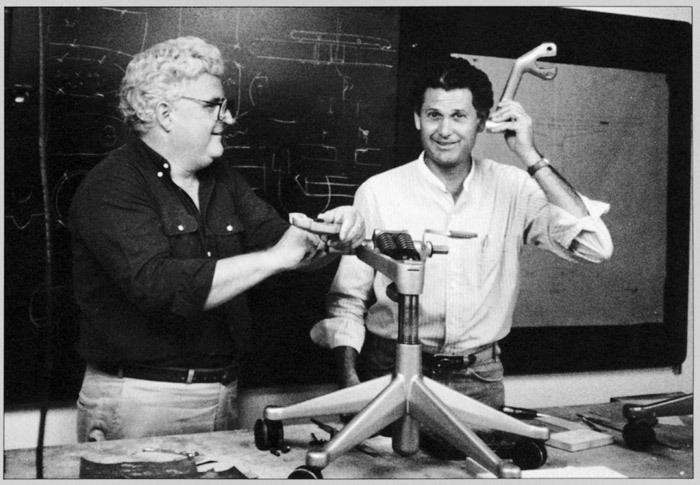 Designing products for the likes of Knoll and Humanscale, he is nevertheless probably best known for an 1994 ergonomic chair design with Bill Stumpf (1936-2006), which became one of the most iconic designs of the late 20th century: Aeron. Produced by Herman Miller, Aeron has maintained unrivalled popularity for 23 years, much to the annoyance and frustrations no doubt of many furniture manufacturers that view the chair as a specifiers’ favourite. But despite Aeron’s immovable popularity Herman Miller took the bold and brave step to update the design and this year, amid much industry talk and anticipation, launches Aeron Remastered. Now in his 80s, Chadwick was approached once again to work on the edit, collaborating with Herman Miller’s in-house design team. And given that the original Aeron forms part of the Museum of Modern Art’s permanent collection, I asked Chadwick if it was the intention to design an icon in 1994, and how will the Aeron Remastered follow? ‘The straight answer is no; it was totally unexpected. If we could do things like that, then we’d be geniuses!’, he says of the success of the original design. Aeron was designed during a period of the technology revolution in which people were finding themselves working at computers and having back problems. The Chadwick and Stumpf design duo worked with a trained chiropractor, a specialist in lower-back support and consultant at Herman Miller Brock Walker, to develop the Posturefit technology for Aeron and later, PostureFitSL. It also featured among other engineered details a tilt mechanism to provide needed health benefits while seated. But despite a carefully executed design to tackle an increasing problem of strain and pain, Chadwick says there was an element of ‘good fortune’ that elevated the chair’s status. It found its way into the entertainment and music industries and it wasn’t too long before Aeron was on sets for films and TV commercials. ‘When it got exposed it became a chair that everybody seemed to want to have, for whatever reason,’ says Chadwick. ‘I guess it became, totally contrary to our expectations, a status symbol, and once it became that it suddenly found a home in the banking industry, the energy industry, in legal firms. The most highly paid workers and conservative offices suddenly had Aeron chairs.’ Chadwick likens it to an Eames lounge chair, as it soon found its way into people’s homes. But whether being used at home or at work, Aeron was the chair to be seen sitting in. It was a must-have of the time, along with car phones and pagers. Chadwick had carried out some initial investigations, which had halted after the scale modelling stage, some years ago. 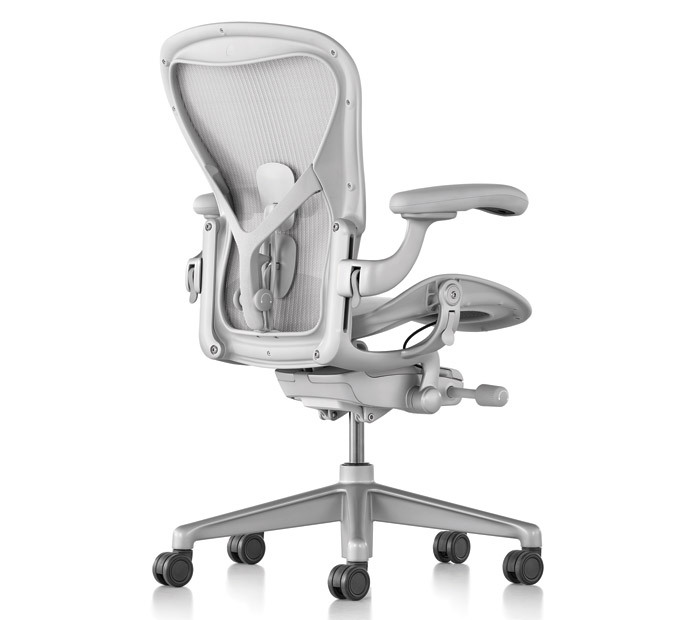 Now issued with a design brief and leading the Herman Miller design team, Chadwick co-designed the Aeron Remastered. The updated version preserves some features from the original, including the seat and back frame aesthetic, but does include a new tilt mechanism that has been used in some other Herman Miller chairs, including Mirra. ‘We designed the new Aeron around this new tilt mechanism and additional research by Brock Walker,’ says Chadwick. Establishing what has become known as ‘zones’ in the seat and backrest, an all-new weaving technology was developed to create different tensions. ‘The [new] tilt mechanism is less visibly bulky, and in sympathy the chair has became much more lighter scaled. Everything on the chair was redesigned and rescaled from the base up; all of the castings, everything,’ says Chadwick.